PayPal, the US-based online payment giant, has moved to expand its global presence with its first Southeast Asian operations centre, the latest in a string of similar offices around the globe. The new centre in Kuala Lumpur will add 300 jobs to the firm's existing 200 employees in Malaysia's capital by the end of 2013, offering customer support in different languages as well as fraud monitoring and prevention, it said. "We couldnt be more pleased to open this new facility in Malaysia to help support our growth and better serve our customers in Asia and around the world," John McCabe, PayPals senior vice president of global operations, said in a statement Tuesday. 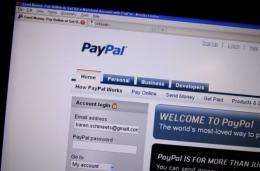 PayPal, which lets users make payments and transfer money through online accounts, already has six other operations centres in Shanghai, Berlin, Dublin, Sao Paulo and two in the United States. The California-based company, controlled by Internet auction giant eBay, has more than 103 million active accounts in 190 markets.